With the assistance of our team of experts, we have been to produce an extensive collection of Programmable Logic Controller. Due to its easy operations and smooth functioning, these are great in demands by our esteemed clients. Our range is developed under the stringent care of experts to ensure high performance, smooth functioning and dimensional accuracy. 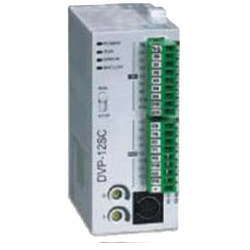 We provide our clients EH2 Series of Programmable Logic Controllers (Item Code: DVP-EH2), which are highly renowned for their outstanding operational speed, exceptional programming capacity and built in application & communication instructions. 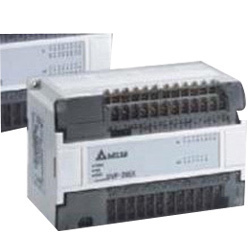 Some more features include optimum performance, usage and less maintenance and our products also consist of multiple special extension modules & function cards. 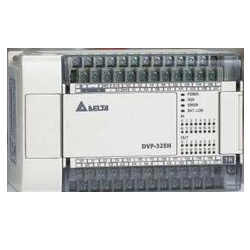 We are highly acknowledged for our customer oriented services and we offer Programmable Logic Controllers (ES Series). This product also acts as representative MPU for the main sequential control. 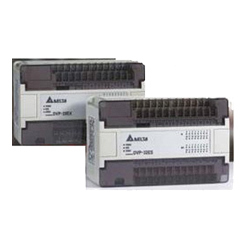 Moreover, they act as an economical solution for small PLCs. These controllers are available in various specifications and are utilized in food processing machines and landscape fountains. 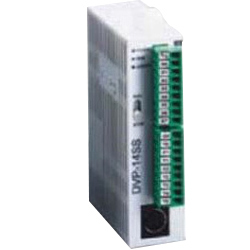 High-speed pulse output: Supports 2-point (Y0, Y1) independent high-speed pulse output of up to 10 KHz. We have established an outstanding base in the market and are offering various sorts of Programmable Logic Controllers (EX Series). Our products also act as cost effective analog MPU. Our products are effectively capable of supporting digital input and output. Plus, the EX series also include a built-in multiple analog I/O channels. This is further more, used for combining various kinds of communication protocols which are needed to construct a control network. 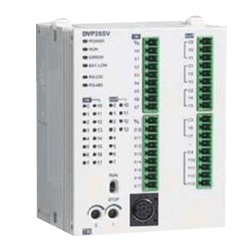 Our controllers are used in various kinds of small PLC application and they are available at effective costs. We are offering wide ranges of Programmable Logic Controllers (SS Series) which are available in various designs and are very slim and compact. They are available at easy prices and are pretty useful for easy sequential control. Moreover, they have been manufactured from effective quality and precision engineered components. We have gained enough specialization in offering SV Series of Programmable Logic Controller (AH500 Series), which are effectively engineered and are randomly used in textile, paper, and food industries. Optimum performance, effective usage, easy maintenance, high quality and durability have developed this series as an ideal choice for our clients. They are properly tested on various quality parameters before final delivery. The left-side parallel high speed extension interface is able to connect to all kinds of network interface, e.g. Ethernet, Device Net, Prefabs and analog. It can connect temperature modules for the demand of immediate control. 16 special extension modules (digital, analog, axis control, communication, etc.) can be connected to SV series (8 on the left and 8 on the right). 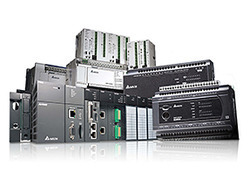 We provide a wide gamut of SC Series of programmable logic controllers, which are in complete accordance with international quality standards. Our products are highly reliable, efficient and are easy to maintain. These are manufactured with the use of quality tested raw materials and always guarantee optimum performance. They are available at completely customer friendly prices and high speed pulse output and pulse counting functions have developed this series as a suitable MPU for motion control. High-speed pulse output: Supports 2-point (Y10, Y11) independent high-speed pulse output of up to 100 KHz (total bandwidth: 130 KHz).